The next piece of jewellery done! And it is a reliquary again. It has an elaborate gothic architectural design on a front and a hunting scene with hounds chasing a rabbit on the back panel. The holly relicts would be safely kept inside and always stay visible thru two small windows. It is possible to open the pendant - the panel slides down to show the precious content. 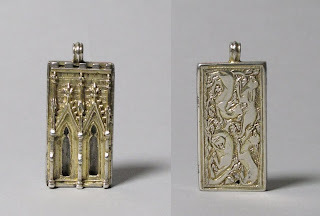 The front panel of the reliquary pendant copy from the Metropolitan Museum. The back panel with a hunting scene. The front panel slides down to reveal the relicts stored inside. For the comparison - the photo of the original pendant. The previous post about the making of this reliquary can be found here.